Led by Germany's Daimler AG, automakers led a positive second-quarter that also saw suppliers and retailers make gains. 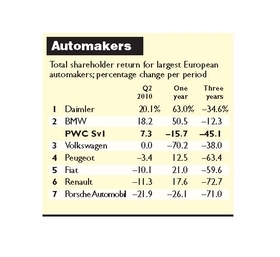 The shareholder value for European automakers increased 7.3 percent; partsmakers rose 4.1 percent and retailers edged up 0.6 percent in the quarter, according to the Automotive News Europe/PricewaterhouseCoopers Transaction Services Shareholder Value Index. All three automotive stock groups beat the Q2 results from the S&P 500, down 2.2 percent; the Dow Jones Industrial Index, which slipped 0.6 percent; as well as Germany's DAX 30 (-3.1 percent), the UK's FTSE 100 (-5.0 percent) and France's CAC 40 (-10.7 percent). "The results for auto groups in the first half of the year are encouraging," said Jason Wakelam, leader of PwC UK's Automotive Transaction Services. "It will be interesting to see whether the measures taken during the downturn will keep companies profitable should trading remain tough in the second half of the year." Damiler AG's value to shareholders increased a sector-leading 20.1 percent in the second quarter, according to the Automotive News Europe/PricewaterhouseCoopers Transaction Services Shareholder Value Index. Late last week, the German premium brand said it would raise its 2010 earnings forecast after revealing that second-quarter earnings before interest and taxes (EBIT) rose to 2.1 billion euros ($2.7 billion) from a 1.0 billion euro loss in Q2 2009. The Mercedes-Benz Cars unit had an EBIT margin of 9.8 percent, which is nearly the 10-percent level Daimler wants the auto division to reach in the second half of 2012. Daimler said in a statement that the main factors for the strong results were: strong sales in China and the United States, a good product mix, better price penetration and positive currency exchange effects. 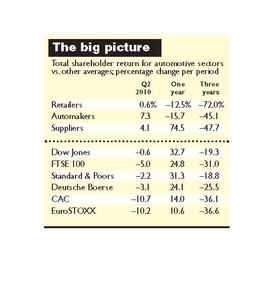 BMW AG was the only other automaker in the table to provide a positive return in the quarter, up 18.2 percent. The Munich-based automaker is benefiting from the same factors that are helping Daimler, such as strong demand in China and the United States and a weaker euro. Earlier this month, BMW said that it expects its 2010 sales volumes to rise by about 10 percent to more than 1.4 million units and expects the full-year EBIT margin for its auto division, which includes the BMW, Mini and Rolls-Royce brand, to be more than 5 percent. "This is a key year in which premium brands will look to bounce back following the impact of the recession on volumes," said Jason Wakelam, leader of PwC UK's Automotive Transaction Services. "So far, volumes have been boosted by demand from growing economies such as China." French suppliers MGI Coutier SA, Montupet SA and Plastic Omnium Co. were the stars of the second quarter as each increased its value to shareholders by 37 percent or more in the three-month period. MGI Coutier SA, a maker of fluid transfer systems for automakers such as PSA/Peugeot-Citroen SA, Renault SA, BMW and Volkswagen, led the table with a gain of 38.8 percent. The company swung to a consolidated net profit of 14.7 million euros in 2009 versus a net loss of 9.4 million euros in 2008. The company attributed the positive results to cost-cutting measures made in 2009 that included the closures of a Mexican plant and an Indian r&d center as well as temporary layoffs in France. The company said the improvement in its performance started in the second half of 2009 and continued in the first three months of 2010. This year, MGI Coutier plans to invest 15 million euros in its production facilities, particularly in France. It also will establish a 1 million euro plant in northern India. Engine parts maker Montupet, which does the majority of its business with PSA, Renault, General Motors Co. and Ford Motor Co., was second on the table followed by Plastic Omnium, which produces front-ends and body panels. 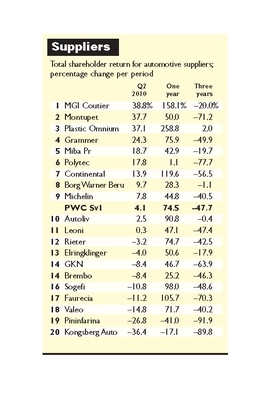 Of the 20 suppliers tracked by the Automotive News Europe/PricewaterhouseCoopers Transaction Services Shareholder Value Index, 11 reported gains in shareholder value and seven had a double-digit increase during the quarter. "The increasing returns seen in Q1 have continued into Q2, with parts suppliers continuing to see the benefits of the cost-cutting measures implemented in 2009," said Jason Wakelam, leader of PwC UK's Automotive Transaction Services. "A continuation of the apparent growth in new-car volumes will dictate whether suppliers will continue to generate these positive returns in the remainder of the year." At the bottom of the table was Kongsberg Automotive Holding ASA of Norway, which saw it shareholder value decrease 36.4 percent during the April-June period. Kongsberg is showing signs that it is ready for a rebound. In June, the company said that it had won three contracts worth a total of 7 million euros to supply gearshift systems to unnamed customers for the next five to six years. The parts will be made at Kongberg's plants in Cluses, France and Mullsjo, Sweden. 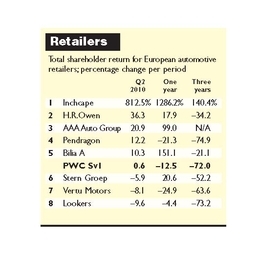 Inchcape Plc went from worst to first in the Automotive News Europe/PricewaterhouseCoopers Transaction Services Shareholder Value Index for retailers. The UK dealer group did so by increasing its value to shareholders by 812.5 percent in the three-month period after its value decreased 1.9 percent in the first quarter. In May, Inchcape said its first-quarter revenues rose 13 percent after new-car sales were stronger than expected in some of its markets and used-car margins held up well. Inchcape said it performed well in markets such as Australia, the U.K. and some parts of continental Europe. "We remain cautious for the remainder of the year as demand for new cars will remain below last year in several core markets, and we still do not expect any sustained global car market recovery to start until well into the second half of 2010," Inchcape CEO Andre Lacroix said in a statement. Inchcape ranks No. 3 on the Automotive News Europe list of the top 25 European dealer groups with sales of 6.29 billion euros in 2009. Five of the eight dealer groups tracked by ANE and PwC had gains during the second quarter. U.K.-based retail H.R. Owens' SVI rose 36.3 percent while Czech dealer group AAA Auto's value to shareholders increase 20.9 percent. Stern Groep NV of the Netherlands and UK-based dealer groups Vertu Motors Plc and Lookers Plc were the only retailers in the table to report Q2 declines in shareholder value. "Dealers have seen an upturn in performance compared with six months ago, driven by improving consumer confidence," said Jason Wakelam, leader of PwC UK's Automotive Transaction Services. "A potential shortage of used cars in the market, as a result of the fall in new car sales over the past two years, may lead to increased competition amongst the dealer networks going forward."